William Martin Doughty (also spelled Doty) was one of the founders of the Oregon Provisional Government that would become the state of Oregon. His name is on the 1901 monument stone at Champoeg, along the banks of the Willamette River, where the final vote took place on May 2, 1843. At age 31, Doughty became the youngest member of the Executive Committee which would be replaced by the office of Governor. Doughty worked for the Rocky Mountain Fur Company and was a featured character in Don Berry's novel, A Majority of Scoundrels. In 1841, Doughty and his Shoshone wife Mary settled into a cabin near Gaston, Oregon and had 12 children. 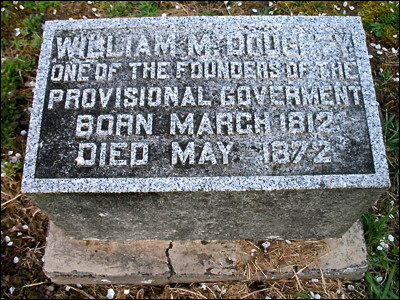 The photo shows William's Doughty's grave at Hills Cemetery near Gaston. The name Champoeg comes from the Kalapuya word campuik which refers to yampa, an edible root.